Who likes having someone look over their shoulder? No one, really. But we would all agree that when we know that our work is being closely monitored by someone, we are more likely to do a better job. It’s not rocket science. It’s human nature. But is the level of quality that your janitorial employees provide high enough to keep your clients happy? If not, inspection software should become those eyes over their shoulders and the guardian of your client list. When it comes to cleanliness, especially if you’re contracting with a medical client or a high profile corporate facility, your client will be your worst critic. The quality of work that you do often has a direct impact on public perception of their business and could be a make-or-break component for many businesses’ success. The work you do, matters! This is why it’s essential that your customers remain satisfied with the level of service you strive to provide, and why you, as the owner or manager must do everything in your power to ensure that each of your employees works as though someone is always watching… because someone always is. Quality Control is key. Don’t let poor quality cost you clients. Contact Janitorial Manager today to demo the JM inspections app. With today’s client-culture of lower loyalty and higher expectations, you don’t need to give your customers any excuse to excuse you and replace you with your competition. Now, clearly, you can’t be everywhere at once. It would be impossible for you to personally impose your level of high quality onto each employee, at every job site, every hour, of every day they are working. Sure, you can provide top-notch training to these employees when they first get started. But when it comes to having an extra pair of eyes on the actual execution of the work after the first few times, those eyes can’t always be yours. This is why you entrust your managers or team leaders with the responsibility of guaranteeing a job well done, every time, through consistent inspections reports. Your role, then, is to equip those inspectors with the tools they need to their job well. Each of your clients’ needs are different: Different floorplans, different surface types, different schedules, different expectations and needs. So, why are you providing your inspectors with the same crumpled inspection checklist for every client? A pen and a vague checklist on a clipboard just won’t cut it anymore. 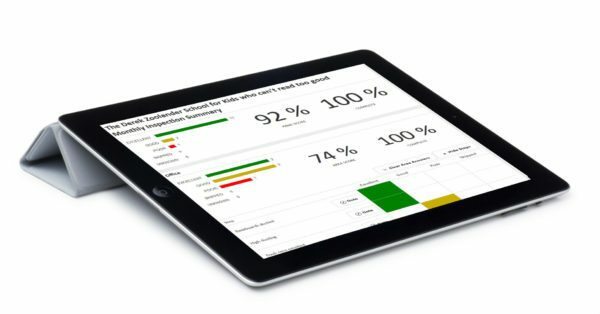 Inspection software available via the Cloud empowers your managers and team leaders to always have the tools they need to do their job quickly, cleanly and accurately – which is something they will appreciate and thrive on. Inspection software provides you with the affordable ability to provide top-notch customization to your clients which supports your efforts to intentionally meet their unique requirements – which is something that customers and prospects are actively looking for and value. Inspection software delivers completed detailed reports directly to you – in real-time! – on your computer or mobile device in a format that is easy to read and intuitively organized for you – which is something you need and can immediately work with. The value of inspection software is that it delivers on all fronts, which helps keep everyone happy. A happy employee is a longer-term employee. A happy client is a longer-term client. A happy you is… well, happy! If you keep experiencing the sting of dissatisfied clients jumping ship due to the level of quality of work that they are encountering, it’s time to contact our team of experts at Janitorial Manager. Let us help you see how you can keep your customers satisfied and on board by utilizing our Cloud-based inspection software. Request your FREE demo, today!